Bless – wonder where he’s off to? He definitely looked like he was on a mission of some importance when I was trying to take a picture of him. It’s amazing what speed they travel when they get going. I read a whole book about woodlice when researching for the novel I’m editing at the moment. Fascinating creatures, they are! Love the photo; so detailed! So, Sarah, are you saying that the insect in your photo is called woodlice (or, a woodlouse, if I put it in the singular)? In ‘Murcan vernacular it’s a roly-poly or roly-poly bug or a pill bug. It would be fascinating to see what different regions and countries call it. Yes, to me it’s a woodlouse, and I’ve heard of it being called a pill bug, but here you are — you’ll love this list, Leigh. That reminds me of my daughter’s snails. My son had better luck with Charlotte the house spider, who was quite happy to stay put in an old ice-ream tub, as long as she had one fat juicy fly fed to her each week! Yes, I hadn’t thought of that, but it is most Japanese. Perhaps I should have saved the picture for a Monday Morning Haiku instead! I like the textures in this photo. You made it interesting. 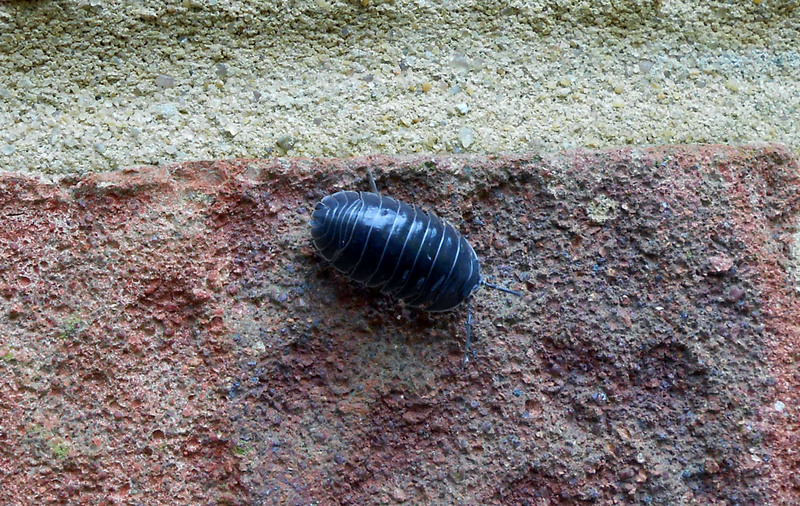 Yes, it was the contrasting textures that first struck me when I spotted that metallic-looking polished woodlouse walking across the rough brick, which was why I rushed for my camera. The woodlouse looks extra shiny as the sun was out. If you enlarge that picture, Andrea, he looks even more adventurous, using his antennae to sense his surroundings. I’ve heard they’re supposed to be a great source of protein akin to their sea faring cousins the prawn. Think I’d rather watch the happy critter meander around than fry him up with soy sauce though! Ah, but insects are the diet of the future, Dave. Get with it! 😉 But seriously, I’ve seen a few articles, online and off- indicating the move in that direction, especially given the burgeoning world population and increasing lack of arable land (since cattle take up so, so much land and resources) but, conversely, the abundance of insects. I, too, have a hard time thinking of eating (on purpose, anyway) insects. My husband has tried eel at a Japanese festival, and I’m not even approaching that bold. I suspect I’ll be a vegetarian in my old age if society has shifted to largely insect-based diets. Woodlouse are meant to taste like shrimps. They’re just a bit smaller and harder to peel! I have a food intolerance to soya, so would have to find another sauce to go with my woodlouse stir fry! Maybe lemon sauce, or curry sauce. We used to call those “pill bugs” because when we picked them up they would roll into little pills. I’ve also heard them called potato bugs here. Nice shot, Sarah. I hadn’t thought about the reason for them being called “pill bugs”, although it should have been obvious!